A much different cup of tea than what I normally like but I can’t stop drinking this! I started off with 100g and was already getting low so I’ve went out and stocked up on another 150. It pretty much tastes the way it is supposed to, very toasty, a tad woodsy, a hint of marshmallow, and a sweetness at the end. Honestly, my only critique may be that it’s too sweet for my liking. Other than that, David has a lot of genius. That looks awesome! I had to cave and get the whole forest set. Really excited. 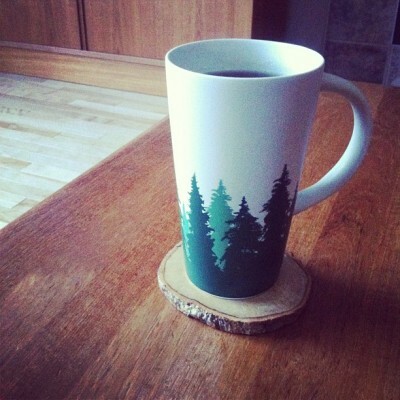 Where did you get your coaster? @CupofTree I got them at Chapters (Canada’s version of Border’s, basically). I’m honestly considering, come christmas time when everyone is getting their trees, making my own from the stumps.